Expired air resuscitation or EAR, also commonly known as mouth-to-mouth resuscitation, is the procedure used to ‘breathe for’ a casualty who is currently in respiratory arrest. This is an effective means of saving another person’s life because through this method, the rescuer can actually provide his own oxygen to the casualty so that the he does not experience serious internal damages due to oxygen starvation. However, to learn effective EAR, with “hands on training” enrol in workplace approved CPR and first aid training. 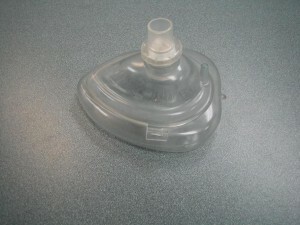 A CPR Mask such as the one shown above is ideal to preventing disease transmission during EAR. The procedure proceeds to CPR if the casualty is showing no signs of circulation such as movement, breathing or heartbeat. Mouth-to-mouth. The casualty’s mouth is sealed with the rescuer’s, in this case. The rescuer pinches the casualty’s nose and blows air into his mouth. Mouth-to-nose. Sometimes facial injuries do not allow the rescuer to breathe into the casualty’s mouth. Therefore, through this method, the rescuer can cover the casualty’s mouth and breathe into the casualty’s nose. He then uncovers the casualty’s mouth to allow him to exhale. Mouth-to-nose and mouth. This procedure is performed especially in young children where the rescuer seals the child’s mouth and nose with their mouth to blow air. Mouth-to-mask. This method is considered to be the safest as it is usually used when the rescuer is unaware of the casualty’s medical health. The casualty may be suffering from any form of infection that may harm the rescuer. Therefore, to ensure safety of the rescuer first, the casualty’s mouth and nose is fitted with a mask (note that all masks are not used in the same way) and the rescuer blows through a valve tube thus, making no contact with the casualty’s mouth, nose or skin. Note: While performing EAR, you must ensure that the rescue breath is effective enough to enable the casualty’s chest to rise and recoil as he exhales. Commence EAR with 5 normal breaths so that it can be followed by 2 effective rescue breaths. Once you see the chest rise, stop blowing air. First make sure that help is sought. If you are not alone, ask somebody to call 911 or a local emergency number for help. In case you are alone, you may make a quick call for an ambulance and return to the victim. Administer 5 initial normal breaths for about 10 seconds. Observe the casualty’s chest and make sure it rises and recoils. As the chest rises, this should take about 2 seconds, observe the chest as it falls—do not overinflate the casualty’s lungs. 2 breaths out of the 5 should be effective. Note: infants and young children (1-8 years) should be given 1 effective breath for every 3 seconds (20/min). Infants are given puffs of air into their mouth. The air will have enough pressure to allow the chest to rise but not fill up the stomach. Do not deliver air with too much force as it may cause the child to vomit. Begin your 5 initial breaths with milder puffs and modify till your breaths are effective enough for a chest rise. Older children and adults (age 9+) should be given each breath for every 4 seconds that is, 15/min. Always make sure you check the casualty’s airways before you administer EAR. An obstruction in the airways may make rescue breaths ineffective. Therefore, make sure you remove any obstructions, if present. Check for signs of circulation. If there is not pulse, begin CPR immediately. If, however, pulse is present, you may administer EAR until help arrives or until the casualty starts breathing. Once the casualty begins breathing, allow him to rest in the recovery position. Stay with the casualty and observe his vital signs such as breathing and pulse, until help arrives.